Set against the backdrop of Iran’s rich, turbulent history, this exquisite debut novel is a powerful story of food, family, and a bittersweet homecoming. When we first meet Noor, she is living in San Francisco, missing her beloved father, Zod, in Iran. Now, dragging her stubborn teenage daughter, Lily, with her, she returns to Tehran and to Café Leila, the restaurant her family has been running for three generations. Iran may have changed, but Café Leila, still run by Zod, has stayed blessedly the same—it is a refuge of laughter and solace for its makeshift family of staff and regulars. Bijan’s vivid, layered story, at once tender and elegant, funny and sad, weaves together the complexities of history, domesticity, and loyalty and, best of all, transports readers to another culture, another time, and another emotional landscape. 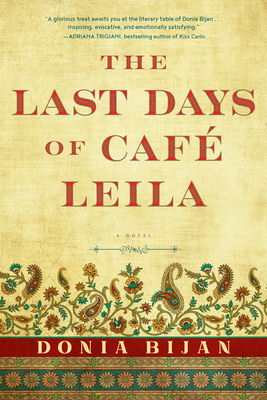 Donia Bijan is the author of the novel The Last Days of Café Leila and the memoir Maman’s Homesick Pie. She graduated from UC Berkeley and Le Cordon Bleu. After presiding over many of San Francisco's acclaimed restaurants and earning awards for her French-inspired cuisine, in 1994 she opened her own restaurant, L'amie Donia, in Palo Alto. Since closing her restaurant, she divides her days between teaching and writing.